Sometimes kid lunches can get boring. But with a few kid lunch ideas, such as a slight change in the presentation, a boring lunch can become fun and memorable. 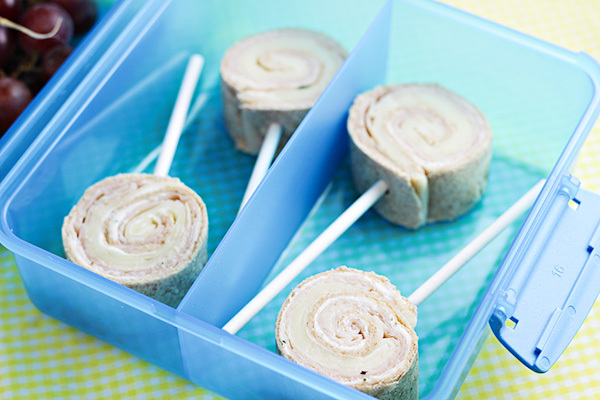 One of my lunch solutions is Tortilla Pinwheel Lollipops — it’s quick and healthy for kids, plus parents will enjoy making it too. 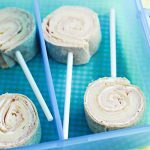 If you’ve ever made or eaten tortilla pinwheels as an appetizer, these will seem very familiar to you. 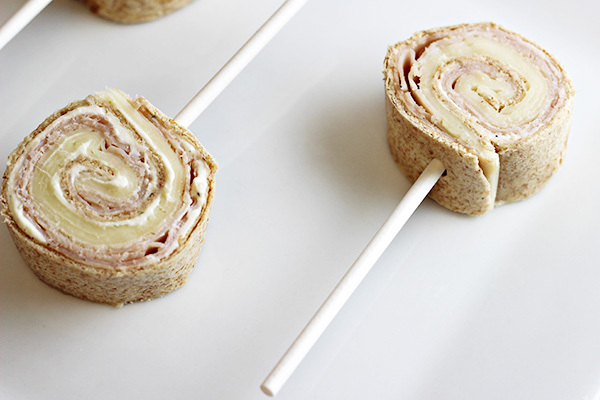 Just just like the appetizers, Tortilla Pinwheel Lollipops are a whole wheat tortilla rolled up with sliced turkey deli meat and sliced provolone cheese. This is also what I call a non-recipe — while there are ingredients and I will show you how to make it, this is extremely versatile. Add any ingredients that you think would be good and create your own masterpiece! To start, combine 8 ounces of softened cream cheese with half of a packet of ranch dressing mix (1/2 ounce). Mix up the cream cheese and dressing mix until it’s fully combined. I did this in my KitchenAid, but you could also easily do it by hand or with a hand mixer. Some of the mixture is spread on a tortilla, almost all the way to the edges. 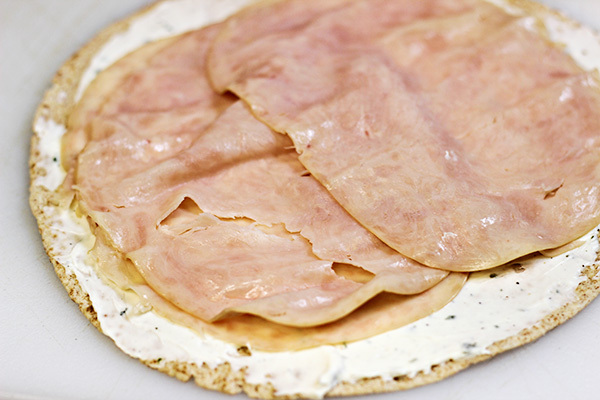 The sliced deli meat is laid on top of the cream cheese mixture, but not completely covering the cream cheese edge. I used four slices. Sliced cheese is then added — I used 4 slices of provolone cheese, but they are very thin slices. If they were thicker, I would have used just 2 slices. The top of everything is given another light spread of cream cheese mixture as this helps to hold everything together. The tortillas are rolled up around the meat and cheese as tightly as possible, but without tearing the tortillas. If time allows, I recommend wrapping up the rolled tortilla in plastic wrap and refrigerating for several hours before cutting. If you are doing this last minute and don’t have the time, don’t worry…it will still work. 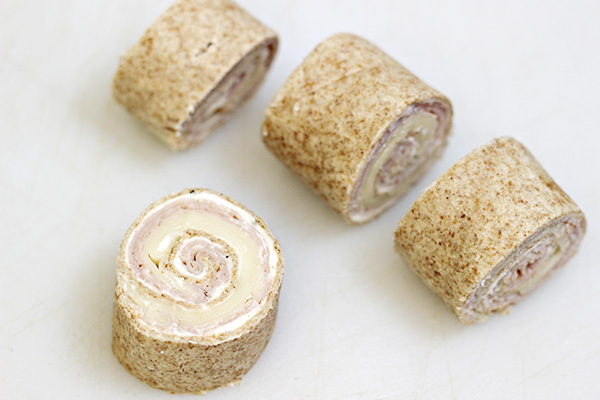 Cut the rolled tortillas into pinwheel slices as seen below. My tortillas were a large soft taco size and I could get 4 good size slices from it. The ends aren’t pretty, so those usually become a snack for who ever is hanging out in the kitchen when I am making these. Insert one end of a 4″ lollipop stick into the edge of the tortilla pinwheel, fairly close to where the tortillas ends. Carefully press the stick up through the pinwheel and just until you can feel that it might start poking out the top (you don’t want to poke it out through the top). And that’s all there is to it! See how easy new lunch ideas can be? 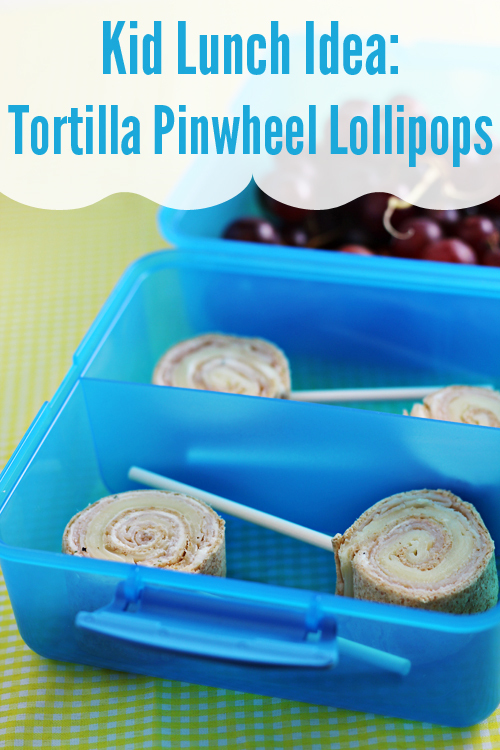 Tortilla Pinwheel Lollipops are all ready for a fun lunch time. Combine cream cheese with ranch dressing mix in either stand mixer, or in a bowl by hand or with a hand mixer. Spread some of the mixture on a tortilla, almost all the way to the edges. 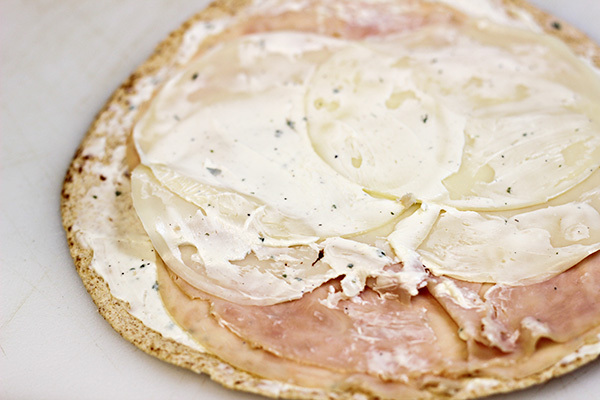 Lay 4 slices of lunch meat on top of the cream cheese mixture, but not covering the very edge of the cream cheese. Lay 4 slices of provolone cheese on top of the meat slices. Spread a thin layer of cream cheese mixture on top of the cheese/meat. Roll the tortilla around the meat and cheese as tightly as possible, but without tearing the tortillas. If time allows, wrap the rolled tortilla in plastic wrap and refrigerate for several hours before cutting. If time doesn’t allow, skip the wrapping and refrigeration. 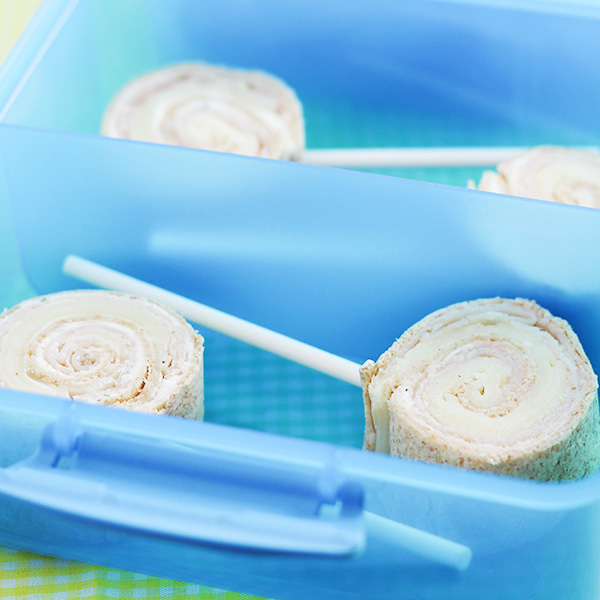 Cut rolled tortillas into approximate 1 1/2″ pinwheel slices. With discarding the ends, you should end up with 4 good size slices from soft taco sized tortillas. Insert one end of a 4? lollipop stick into the edge of the tortilla pinwheel, fairly close to where the tortillas ends. Carefully press the stick up through the pinwheel and just until you can feel it reach the very opposite side of the pinwheel and is close to poking through (but don’t poke through). Great idea!! Can’t wait to try this for my kids! dumb question… where do you get the lolipop sticks from? Hi Anita! Not a dumb question at all….I bought mine at Walmart in the craft area near the Wilton baking supplies. But you can also get them at Michael’s craft store or other craft stores. Hope that helps! Yummy!! 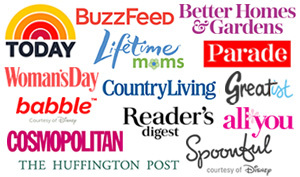 Thanks for all of your amazing ideas and posts! I pinned these yesterday!!! Seriously, SO cute! I love that they fit in lunch boxes too! 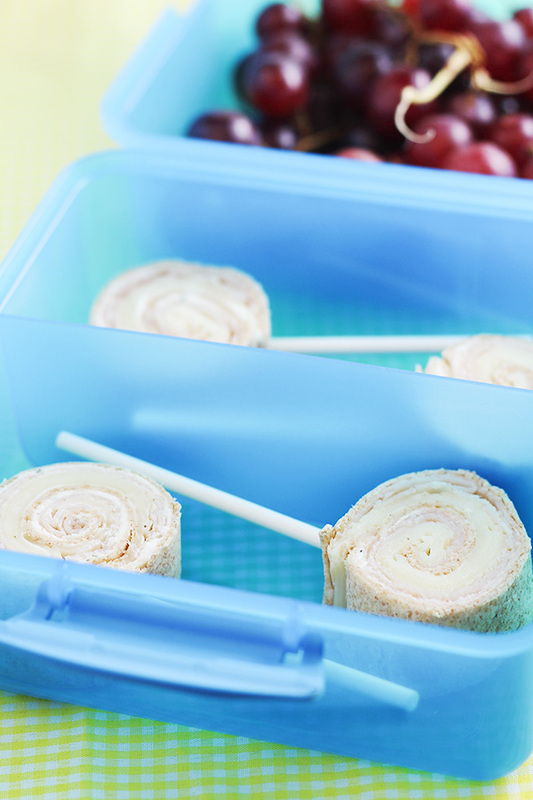 We love wraps/rollups and I never thought to make them fun by adding a lollipop stick. Great idea! This is absolutely adorable! My toddler will love these! Oh, these look good! My little girl would absolutely love them. I’m starting to gather lunch ideas for her summer camp since she can’t bring peanut butter. I think this will be one of her favorites!